Slow page load times are a bigger problem than many people realize. Run a quick website speed test on your homepage. How’s it look? That might seem reasonable. But people hate waiting. So it makes sense that longer page load times hurt your sales numbers. 40% of people abandon a website if it takes longer than 3 seconds to load. While a 4 second load time might not seem so bad, you could be missing sales because of it. And it’s not just customers who give up on your site if it’s loading slowly. Google and Facebook also dislike slow loading websites. Here’s what’s going on: Facebook now displays links to slower loading websites lower on people’s news feeds. Your website load time is also one of Google’s SEO considerations. Slower loading websites get pushed to the bottom of the search results page. Unless your website is featured in the knowledge graph or you’ve got paid placement on Google, your site isn’t getting as much visibility as it could. Accounting for all of these factors, a one second delay in page load time reduces conversions by as much as 7%. To put it in perspective, that would be 1.6 billion in sales for Amazon. All in all, a slow loading webpage can cost you quite a bit of money. That’s a tricky question, since every website has a different set of necessary functions. Additionally, each website has a different expected workload. A WordPress site has different issues to contend with than a Shopify or Magento site. Some sites can accomplish their mission without any exciting visuals, like a Google AMP page. At the other end of this spectrum are websites that need some visuals to get their message across. Imagine the GoPro website without any visuals. Very disappointing. So don’t strip down your website to the point that it’s too minimal to sell in the name of getting faster load times. People also leave websites because they aren’t adequate. Build a website that gives users everything they need. Get it to load in under 4 seconds. This article is about website load times, so we’ll assume that your does everything people need it to. Images are hands down the biggest cause of slow page load times. The first thing to do is only use images where you need to. Many websites use images to display text. This might save time in website development, but in terms of website efficiency, it could lead to high website abandonment rates. Only use text to display text. Dealing with these problems isn’t too difficult. Just do two things. There’s a lot of metadata hidden in your image files. The metadata is useful for developers, but it really slows down your website. 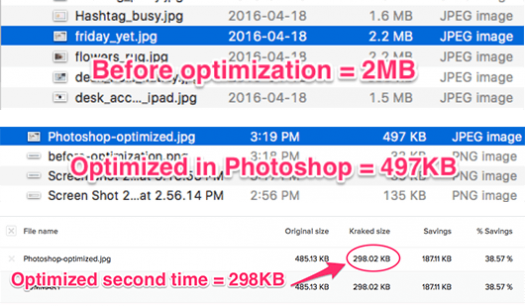 Fortunately, this is relatively easy to solve: Losslessly optimize your images, and use images of the appropriate size for your website. Losslessly optimizing your images strips away any metadata that doesn’t improve the visual quality of the image. This is mostly a matter of running them through optimization software. It’s pretty simple. With the right tools, you can very quickly optimize the images from your website and replace the unoptimized images with their more space-efficient counterparts. The second issue involves a bit more work. However, it’s just as simple. Certain image types are better for different things. On websites, most images are either PNG files or JPEG files. Using the wrong image type for the wrong purpose will make your website much slower. PNG files: these are best for logos and icons. The PNG format supports transparency. It’s a good format for a visual that you need to overlay on top of other elements. However, PNG files get data heavy very easily, so they’re not ideal for large images or photos. JPEG files: these are best for photos and large images. JPEG files don’t support transparency. They’re not ideal for layering. However, JPEG files are more data efficient than PNG files. Using JPEG images whenever you don’t need a PNG will save you a lot of data. So, unless you want to keep trying to sell stuff with a sad panda, use the right image for the job. If you’re like me, you’re very bad at coding. If you’re not like me, you may be able to fix this yourself. There are certain best practices in coding that are designed specifically to make the code do its job faster. Make sure that your web page code follows these best practices. Clean code. Your entire website is built from code. More complex websites need more code. Facebook has 60 million lines of code. You probably don’t need that much. A good web developer will use the least amount of code possible, while still creating a website that does what you need. Minimal inline CSS. Using inline CSS makes your HTML less efficient. Many coders consider inline CSS to be lazy coding. Build a CSS stylesheet. However, don’t build more stylesheets than you need. Most websites function well with a single CSS stylesheet. Page caching. Without page caching, each time a user visits your site, the code is retrieved from the server. The website gets built from the ground up for each visitor. With page caching, the server simply sends a pre-constructed snapshot of your page to each visitor, which can dramatically reduce load times. However, page caching cannot be used with websites that require authentication. HTTP Compression. The less data you need to send for your website to load, the better. So, find out what’s compressible (like images). Then compress all that data into the smallest block possible. Plugins are rad. They’re great for adding dynamic content to your website. Some websites—like WordPress sites—rely on plugins more than others. 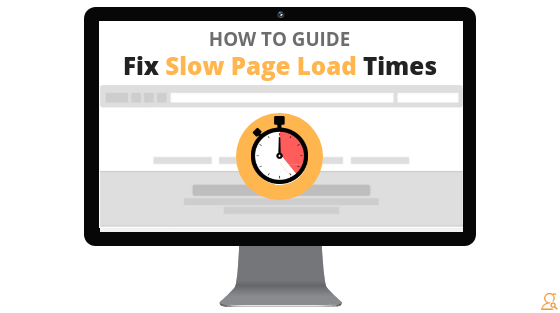 Unfortunately, plugins present a few challenges for page load times. Each plugin contributes a little bit more load time. Plugin bloat. The biggest issue is too many plugins. The obvious first step is to remove any plugins that you’re not using. Second, drop any plugins that aren’t netting you a meaningful return. Flash content. Flash content makes your website more interactive. It also makes your website load very slowly. Flash content is bulky, and not data efficient. The best way to resolve this issue is to replace Flash content with HTML5 content. Most browsers can support concurrent downloading from 2 to 4 different sources. Hosting your website on a single domain is like driving on a four lane highway, but only using a single lane. Domain sharding is simply storing different pieces of your website on different servers. This way, when a user’s computer requests your website, it will download faster using the concurrent downloading capability of their browser. Splitting up your website so that the different pieces can be simultaneously retrieved from different servers is an administrative hassle. To help with this, you can utilize DNS CNAME records to trick computers into thinking that your website is hosted on multiple domains, and use all four lanes on the freeway. Ads are an excellent way to monetize your website traffic. However, there are two good reasons to scrutinize which ads you include on your website. First: if your page is overrun with ads, it can really hurt the user experience. Isn’t it frustrating when you click on something in Facebook, only to find that you can’t see any of the content because there are ads in the way? A frustrating user experience drives customers away, regardless of how fast your website loads. So make sure that your ads are well placed, and don’t get in the way of what the user wants to do. Second: too many ads makes your website load slower. The biggest takeaway here is that if ads aren’t your main revenue stream, you can probably do with less. Look at your lowest performing ads. Consider whether or not they’re worth the extra time it takes your website to load. That slowdown could cost you some sales. 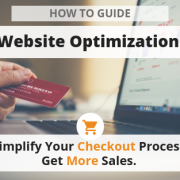 Then, make sure that the ads you do include follow the rules of website optimization so they don’t increase your load times. Improving website load times is kind of a technical process. Unless you’ve got a lot of web development savvy, it’s best to have your website audited for performance issues. 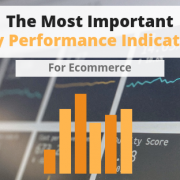 There are a number of tools and services for identifying problems with your website, like this website performance scan. You might not be able to fix the issues yourself. But you’ll know where the biggest problems are, which will make it easier for a professional developer to fix them. Remember, your website doesn’t need to be face meltingly fast. Load times of less than 4 seconds will do. But faster is better. How’s your website doing? Leave a comment and let us know how fast your web page loads!